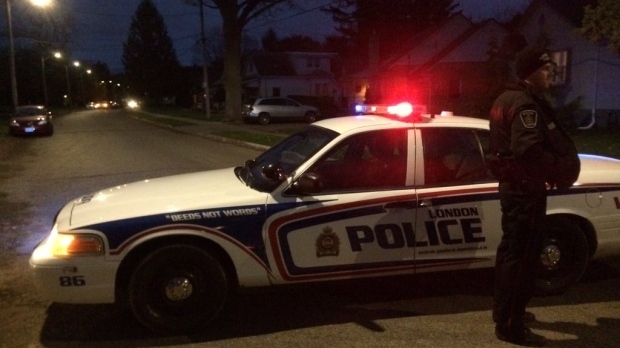 London police seized a stolen pickup truck and a replica firearm after an hours-long standoff on Forward Avenue. Officers say they saw a stolen vehicle parked outside a residence on Forward Avenue on Thursday around 2:30 p.m.
Police had information that there was a firearm associated with the vehicle, and the Emergency Response Unit was called in to assist. After about seven hours, a warrant was executed shortly after 9:30 p.m., and as a result the truck, replica gun, several bicycles and a small motorcycle were seized. One man was arrested in relation to a separate OPP investigation, and was turned over by London police. Two individuals were not arrested, and warrants have been issued for their arrest. A 26-year-old Ilderton man is charged with two counts of possession of stolen property over $5,000 and two counts of breach of probation. A 24-year-old London woman is charged with failing to comply with recognizance. Forward Avenue was closed for a number of hours and area residents between Delmage and Wood Street were not allowed to return home during the standoff. Anyone with information in relation to this incident is asked to call police at 519-661-5670 or Crime Stoppers at 1-800-222-TIPS.